← Happy New Year from Aristos! 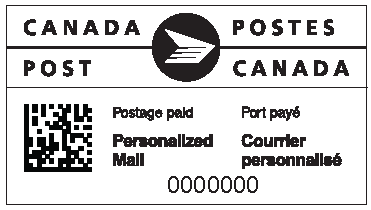 Canada Post has rolled out new Postal Indicia artwork for their Personalized Mail service. The new artwork reflects the new name (this was formerly known as Addressed Admail) and includes a 2D barcode. The new artwork won’t be mandatory until March 2017, so you have a lot of time to use any existing stock you may have with the old artwork. Please feel free to contact us if you want new Personalized Mail Indicia artwork with your specific customer number – we will be happy to make it for you! This entry was posted in Canada Post and tagged addressed admail, mailpiece design, personalized mail, Postal Indicia, Smartmail Marketing. Bookmark the permalink.